Using the 1930 census for their data, two distorted maps show where residents in the United States lived during this period of time. 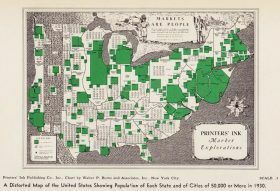 Both vintage cartogram maps exhibit how bunched Americans were in the north and the east coast, clustered in urban areas, despite the westward expansion of the previous century. As the Making Maps blog first featured and as Slate discovered, the size of New York and New Jersey grows in proportion to its expanding populations, moving further east into the ocean.